The Gulf Coast Winter Classics Horse Show has welcomed horses and riders to the Mississippi Gulf Coast for the last 18 years. This series of hunter and jumper events last for six weeks, Wednesday through Sunday each week. The main event, the Grand Prix, is on Sundays at 2. That’s when we went, and we have to say that this event is unlike any other on the Mississippi Gulf Coast! People of all ages gathered at the Harrison County Fairgrounds to watch the weeks’ top riders compete. At the Grand Prix each Sunday, the winner receives $25,000-$50,000. Throughout the entire competition more than $1 million in prize money is given away! 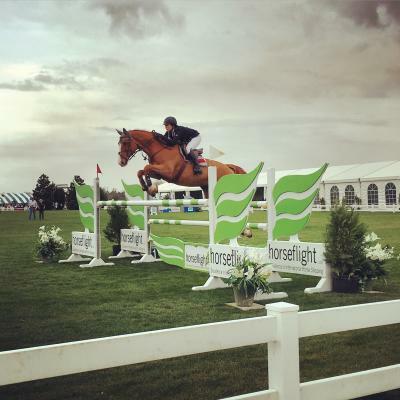 The Grand Prix was a jumper event, meaning that each rider was trying to finish the race fastest without knocking down rails or incurring penalties by the horse’s refusal to complete the obstacle. We watched the contestants and their horses vie for the grand prize, and the competition sure was a close one! The top three contenders all finished within one half of a second! The best part about this event is that it’s free! You can bring the whole family, because the fairgrounds are well-equipped with activities to keep the kids busy including a miniature pony petting and a bounce house. Riders can begin participating in the Gulf Coast Winter Classics at age six. During the six weeks, the Harrison County Fairgrounds are home to approximately 1000 horses, competing throughout the seven competition rings on the grounds. This horse show brings participants from 33 states with 96% of them being from outside of Mississippi. There is truly something for everyone at the Gulf Coast Winter Classics, making this enormous event is a must-see on the Mississippi Gulf Coast!